Ammunition thrives to make wines rich with American spirit. I think we can all agree, especially within the last 10 to 20 years, there’s nothing more American — nothing more Californian — than Pinot Noir. As Director of Marketing for Ammunition David Dees says, “No one needs another wine.” True fact — the grocery store shelves are lined with Pinot Noirs boasting Sonoma grapes. But I say to you, what Ammunition has created is a Pinot of a different caliber, hitting a target and satiating a need I didn’t even know existed. About the Wine: The Ammunition Wine 2016 Pinot Noir is made from 100% Pinot Noir grapes harvested from two single vineyards in Sonoma County — one from the Russian River Valley AVA, one from the Carneros AVA. The wine was aged in French oak barrels (75% new, 25% used) for 8 months. Flavor Profile: On the pour, this Pinot Noir is a feminine pink-purple, but settles into the glass with a mature, jewel-like garnet red. The initial aroma is of roses full stop. You can perfectly picture the full, plush red flowers with their almost velvety petals. Stick your nose in the glass and add to that romanticism a bit of spice – as the scents of a chili-cherry compote and cracked white pepper enter the lungs. Swirl, and the Ammunition Wine 2016 Pinot Noir releases even more earthier aromatics like eucalyptus leaf, cedar wood, as well as a background of livelier fruits like fresh strawberries. 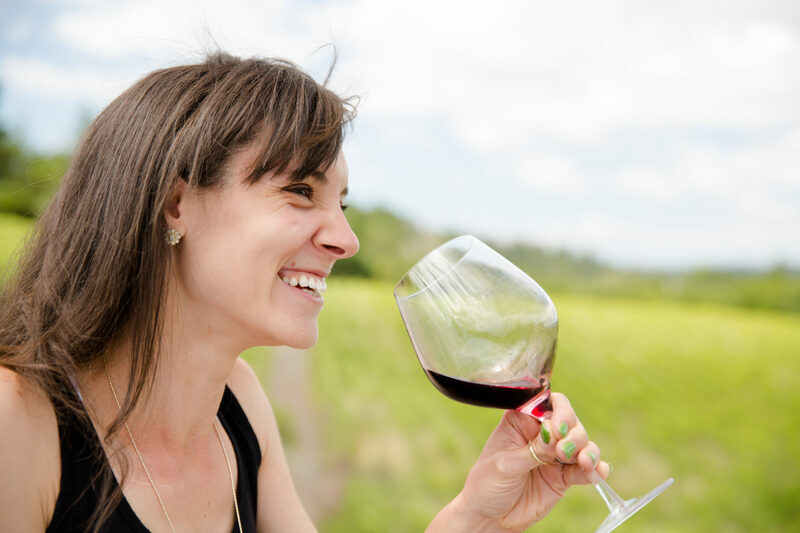 The Pinot Noir enters like silk on the tip of the tongue, with an almost fizzy effervescence riding through the center of the palate, and almost sneaky tannins that appear and almost immediately disappear along the perimeter of the mouth. Given the look and the nose of the Ammunition Wine 2016 Pinot Noir, it is surprisingly light bodied — I would say a medium or medium-light body overall. Dominant flavors are of fresh cut wood, cranberry jam, pomegranate, and a hint of diet cola. The finish is a lingering one, with an almost fizzy feeling on the tongue, and leaving a clean, neutral palate ready for another sip. Food Pairing: Because the Ammunition Wine 2016 Pinot Noir has a lighter body, but strong flavors, it would actually pair quite nicely with a leaner cut of red meat, like a veal tenderloin or venison. Play with those fruit flavors by dressing the medium-rare meat with a cherry compote, but keep the overall meal light accompanying it with an herb-based salad, which will most certainly pull out that initial earthy-garden aromatics. A man after my own heart, winemaker Andy Wahl suggests Pinot and pizza, “But that’s just because I like pizza,” he says. (So do I, Andy.) He adds, “I just opened a bottle […] and drank it with some german sausages and sauerkraut and it was tasty.” I didn’t think about it until he said that, but the Ammunition Wine 2016 Pinot Noir does have an almost Beaujolais quality about it — a wine I actually love pairing with hotdogs. So, there you go. I received the Ammunition Wine 2016 Pinot Noir as a sample for review. (Cheers David!) Price: $28. For more information about Ammunition Wine and to purchase wines directly, please visit the Ammunition Wine website.